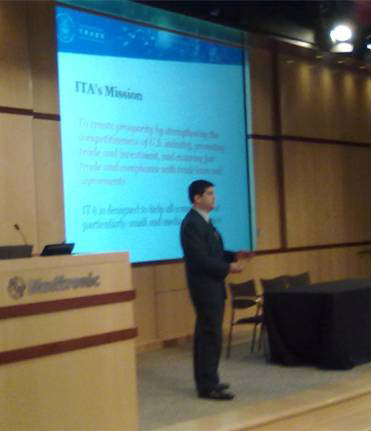 ITA’s Office of Health and Consumer Goods (ITA/MAS/OHCG) has begun organizing and conducting seminars for U.S. medical device small and medium-enterprises (SMEs) in partnership with industry and U.S. Export Assistance Centers (USEACs) under the National Export Initiative or NEI. Despite the economic odds, the medical devices industry has experienced dynamic growth in recent years. The U.S. medical devices industry has had a consistent trade surplus, and U.S. firms are the leading global producers of advanced technology medical devices. OHCG hosted its very first seminar for medical device SMEs in Minneapolis, Minnesota on June 11 led by ITA National NEI Director Courtney Gregoire. Attendees were also pleased to welcome Minnesota Senator Amy Klobuchar who has been an emphatic advocate for the medical device industry. Remarkably, large multi-national medical device firms have been interested in supporting these export seminars, because SMEs are a major source of industry innovation and are also an important component of the medical devices supply chain. Also, firms participating in existing Department of Commerce public-private partnerships, such as Federal Express, have expressed interested in supporting medical devices NEI SME export seminars. Gerry Zapiain is an International Trade Specialist and has been with the International Trade Administration for over ten years in a variety of capacities. He currently serves as a Health Team International Trade Specialist in the Office of Health and Consumer Goods within Manufacturing and Services.